We went to the Châtelain market last night, which involved browsing stalls of produce, cheese, charcuterie and other delights - all without the politically correct smugness of an American greenmarket. 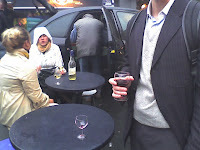 We then did as all the locals (read: expats) do and drank a glass of wine in the rain. Not sure how high this experience ranks on the ALC (Authentic Local Color) scale, but it certainly was enjoyable.